Paul Singer is widely known in Argentina and the United States to be Jewish. His philanthropic and political engagement includes public support for Jewish causes. Irrespective of the rights and wrongs of Singer’s financial decisions, CST felt that the Daily Telegraph should not use references to the famously antisemitic caricature of Shylock from the Merchant of Venice to criticise the financial activities of a Jewish public figure. This is particularly relevant in this case, because last year the then Argentinian President Kirchner was widely criticised, including by Argentinian Jews, for advising Argentinian school children to read the Merchant of Venice in order to understand their country’s debt crisis. Kirchner also alleged a bizarre conspiracy theory involving Singer and various Jewish and American organisations following the suspicious death of Alberto Nisman, who was investigating Argentina’s failure to successfully prosecute the 1994 bombing of the AMIA Jewish community centre. 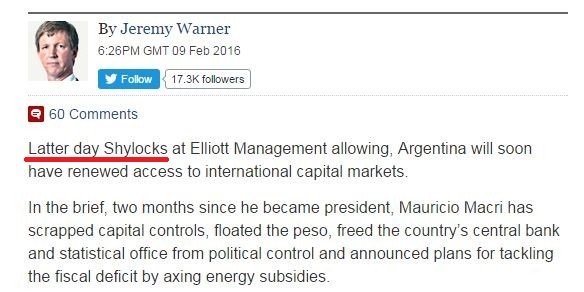 It is not clear whether Jeremy Warner was aware of this background when he bookended his own article with two Shylock references. CST wrote to the Daily Telegraph to complain about the article. We did so via a letter for publication because the Daily Telegraph does not appear to have a readers’ complaint process similar to that of the Readers’ Editor at the Guardian. Our letter was not published but the two Merchant of Venice references have subsequently been removed from the article. We are pleased that the references have been removed and we hope that the Daily Telegraph will take more care in future. As we pointed out in our unpublished letter, antisemitism does not need to be conscious or explicit; it can be transmitted through cultural references of which Shakespeare’s villain Shylock is one of the best-known. We would also encourage all newspapers to develop accessible, transparent complaint processes for readers so that problems of inaccuracy, bias or potential bigotry can be quickly and clearly addressed. In the 21st century who would think that anyone working for a large Publisher would express his/her bigotry or lack the training & education to recognize the significance of what they are putting into print. My gut reaction is they allowed their true feelings to slip out. You would think though someone reviews and might take that person aside and have a talk. You expect too much of the British. I don’t think so. Expectations should be high. Their tough enough to take it. So they take out the phrase “latter day Shylocks” – and we all know what that means, don’t we – and then rewrite the article with the phrase “pound of flesh”. Now I just wonder where the phrase “pound of flesh” comes from. It couldn’t possibly be from the Merchant of Venice, could it? Both references were in the original, and both were later removed. If it takes Shylocks to bring down the Kirchnerismo regime of that barmy horrible and disgusting Kirchner woman then so be it…. Jeremy Wagner mentions “Morally Indefensible” at the same time that he inserts these racist terms like “Shylock and Pound of Flesh” in his article….This guy is a like real Clown….